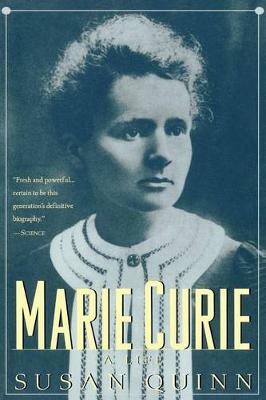 One hundred years ago, Marie Curie discovered radioactivity, for which she won the Nobel Prize in physics. In 1911 she won an unprecedented second Nobel Prize, this time in chemistry, for isolating new radioactive elements. Despite these achievements, or perhaps because of her fame, she has remained a saintly, unapproachable genius. From family documents and a private journal only recently made available, Susan Quinn at last tells the full human story. From the stubborn sixteen-year-old studying science at night while working as a governess, to her romance and scientific partnership with Pierre Curie,an extraordinary marriage of equals,we feel her defeats as well as her successes: her rejection by the French Academy, her unbearable grief at Pierre's untimely and gruesome death, and her retreat into a love affair with a married fellow scientist, causing a scandal which almost cost her the second Nobel Prize. In Susan Quinn's fully dimensional portrait, we come at last to know this complicated, passionate, brilliant woman.